In the Small Size League (SSL) each team builds autonomous cylindrical robots that play soccer with an orange golf ball. During the game eight robots from each team try to score goals using fast paced pass maneuvers and intense dueling strategies. The robot system is completely autonomous, which means that no team member is allowed to control the robots in any way. Instead, a central PC (we use a simple laptop) receives preprocessed camera data, runs the team’s AI and communicates with the robots by radio. The playing field currently spans 9 m x 12 m and is laid out with a carpet. All sixteen robots are seen by eight cameras positioned above the field. These are connected to a centralized Vision computer. As every robot is fitted with a standardized pattern atop it can be identified. Here the color in the middle represents the two teams and the butterfly pattern around, the front facing direction and number. The size of the robots is limited by rules to a diameter of 18 cm and a height of 15 cm. That is why the teams robots usually look very similar. In contrast to that the mechanical and electrical design can differ very much. Past experiences show that most systems are built with four omni-wheels and electro magnetic kicker devices for linear and chip kicks. Currently a human main referee is responsible for all decisions. He is supported by a second assistant referee and a RefBox operator. The RefBox is a dedicated computer used to input all decisions that are then sent to the teams via network connection. In an effort to automate the game even more autonomous referee systems called Autorefs were developed and will see further usage in the league. Both opposing teams get all information from the RefBox and Vision systems via a local network. From this point forward it is the sole responsibility of the teams to handle the input. 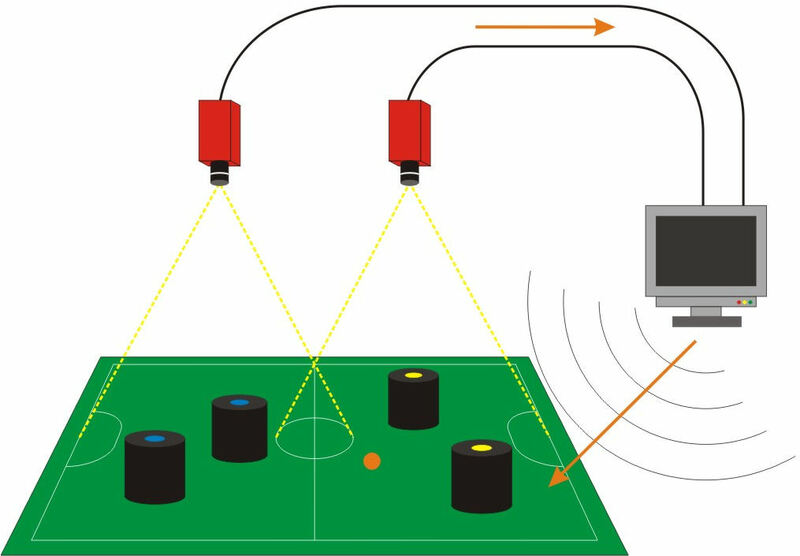 Usually the camera data is further processed and the geometrical placement of robots and ball on the field detected. The teams AI will then decide for a strategy and send it’s current decisions to the robots. This is done about 60 times a second to ensure smooth movements. During the game no team member is allowed to touch their computer running the strategy. Only during timeouts and halftime changes can be made. 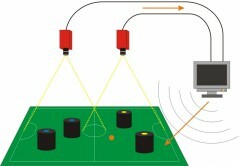 One team member is allowed to communicate with the referee and exchange robots on the field.